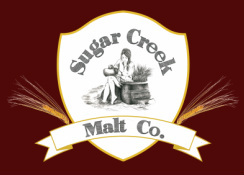 Sugar Creek Malt Co. is a family owned and run malthouse located in Boone County, Indiana. We want to give the opportunity for our local breweries to produce a truly LOCAL beer! Sure beer is brewed locally, but the grain in that beer (which is the main ingredient in beer after water) comes from all over the world. Let's change that! Lets make our beer truly LOCAL! 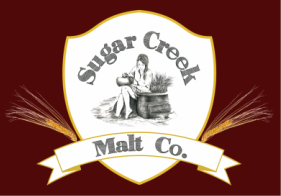 Sugar Creek Malt Company's mission is to produce high quality malt using high quality grains. We want to rekindle a sense of community where the brewer collaborates with the maltster and the farmer. As a small family run malthouse are able to produce the traditional style malts as well as experiment with unique grains and methods. We are a third generation family farm located in the northern part of Boone County, Indiana located about 40 miles north of Indianapolis. Our farming operation currently consists of 1,400 acres producing corn, soybeans, and wheat. Now we have added malting grains! Grains used to produce our malt will originate not only on our farm but from other family farms within a 200 mile radius of our malthouse. This will diversify our grain production areas and ensure a steady supply of high quality grains should mother nature hit us with extreme weather such as drought, hail, flooding, or molds. The grain used for malting is a very fragile grain and needs special treatment . Our contract grower farms are educated about the proper production methods for malting grains. By networking with other small family farms we not only diversify our grain source but promote the sustainability of rural America. Sugar Creek Malt Company uses a pneumatic malting system. Everything is done by hand from turning the germinating malt to bagging. This allows us to know exactly how the malt is progressing hour by hour, allowing us to produce high quality malt for your brewing needs! All malt undergoes malt analysis telling us the quality of each batch made. This gives both the maltster and brewer the crucial information needed to make a superior, excellent tasting beer! We are not only making base malts. We are also now smoking malt! We have over 40 woods, barrels, herbs, and peat to choose from. Look for the roast house to be up and running soon! Locally Grown. Hand Crafted. Malt.